…means fresh air, sun, smell from the herbs and an endless view of the bright blue Aegean Sea. You can have this view from almost every single point of your route. Things to be taken into consideration; it was not until the mid 1990s that the first proper roads were constructed. These are; a) From Chora to Arkesini southwards and b) from Chora to Egiali northwards. Before then, the car as a means of transport was of little importance. Donkeys used to be the essential means of transport by land and therefore, a well-designed "system" of cobbled paths used to cross the island and guarantee the transportation of goods to the villages. 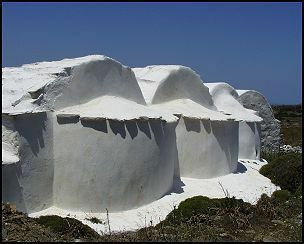 Despite the fact that nowadays the car has already "invaded" the island, Amorgos remains peaceful and quiet. The traditional paths have mostly been preserved, providing us with amazing opportunities of exploring the island. Even today, it is possible to meet donkeys carrying heavy loads of fresh goat milk from the fields to the villages. It is at this specific moment that time seems to have stopped for a while and an idea of how hard life in Amorgos used to be can be gained. 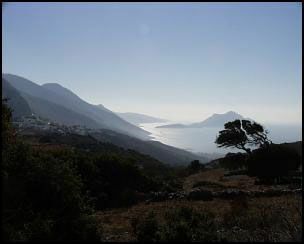 With an altitude of nearly 850 meters, Amorgos offers a variety of different possibilities of exploration. Considering that all this hypsometrical scale is actually completed within a short distance starting from the shore, it is easily understood that certain requirements must be met by anyone attempting such a tour. On the ridges the sun is really merciless. On the high peaks, the whole area can be covered by dense fog within a few minutes, while strong winds usually blow. These hard conditions should not be underestimated in any case. Drinkable water, suitable shoes and a special jacket are necessary. Even in the marked routes, suitable shoes should be worn and drinkable water should be brought along. Below are presented many routes for rambling over the island. Four of these routes go through marked paths (red and white signs with numbers). The "Royal Route" is the route 1, which starts from Chora, goes past the Monastery of Hozoviotissa and continues towards Egiali. This is distance of nearly 16 Kms along the central ridge of the island. 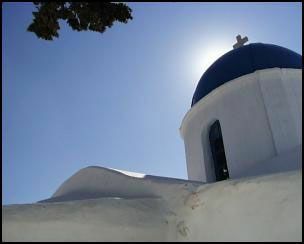 It is an unforgettable trip with a view of Naxos, the Small Eastern Cyclades and Ikaria. The route 4 is also wonderful. Starting at Egiali and finishing at Egiali as well, it goes round the whole valley behind the Bay of Egiali. This route goes past the fascinating villages Tholaria and Lagada. The walking time mentioned for each route concerns walkers with medium training and experience. Apart from the routes described below, there are also many other possibilities of exploring the island. For example, there is the route to the high peak of Profitis Helias at Chora (almost 700 meters altitude) or the route to the vertical cliff of Ancient Arkesini in the southern part of the island. There is also the route to the Mountain Korakas, which is the highest mountain of the region. A lot of interesting opportunities for exploration can be found in the Bay of Egiali in the north of the island, such as the remote small bays of Megali Vlichada and Mikri Vlichada which are also suitable for swimming. From the peaceful South. From Arkesini to Vroutsi and then to Katapola. A circular road that leads us from the port of Egiali through the 2 mountainous villages Tholaria and Lagada and ends at the port area again. To go by feet to St. George Valsamitis you have two different possibilities. One path from Katapola and a second one from Minoa. From Chora to Katapola a peaceful trip to the coast. The lonely rocky rampart - tracing the miners above the picturesque monastery of St. Theologos towards the church of Stavros.